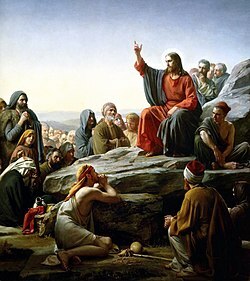 This article is about the philosophy encompassing the teachings of Jesus. For the Catholic religious order known as the Jesuits, see Society of Jesus. Jesuism, also called Jesusism or Jesuanism, is the teachings of Jesus in distinction to the teachings of mainstream Christianity. In particular, the term is often contrasted with Pauline Christianity and mainstream church dogma. The term Jesuism was coined by the late 1800s. It is derived from Jesus (Jesus of Nazareth) + -ism (English suffix, a characteristic or system of beliefs, from French -isme, Latin -ismus, Greek -ismos). The Orthodox theologian Sergei Bulgakov further noted in 1935 that "the concentration of piety on the Christ alone has become a deviation already known by a special term as Jesusism". Influential Catholic theologian Karl Rahner referred to "Jesusism" as a focus on the life of Jesus and attempts to imitate his life, as opposed to a focus on God or the Christian Church. University of Melbourne professor Lindsay Falvey noted in 2009 that "the gospel story so differs from Church doctrine that it could well be of a different religion – Jesusism". Jesusism became the subject of increased academic discussion following its reference by Duke University neurobiologist and philosopher Owen Flanagan in his 2007 book The Really Hard Problem: Meaning in a Material World. Flanagan defines Jesusism as the "message" of Jesus and notes that he "call[s] it ‘Jesusism’ because most Christian Churches do not endorse Jesus’ message truthfully". Flanagan characterized Jesuism as a naturalistic and rationalist philosophy, rejecting the conflict between faith and science. Rodney Stenning Edgecombe, a professor at the University of Cape Town, in a 2009 essay titled Communication Across the Social Divide remarks how Christianity shifted away from Jesuism; the moral tenets Jesus preached. The terms Jesuism, Jesusism and Jesuanism are also referenced popularly on religious blogs and internet groups. There is no definitive meaning of Jesuism and hence no clear ideology. Various groups use the terms Jesuism, Jesusism and Jesuanism. These include disenchanted Christians who are critical of institutional religion or Pauline Christianity, people who identify themselves as disciples of Jesus rather than Christians, Christian atheists who accept Jesus' teachings but do not believe in God, and atheists who are critical of all religion including Jesuism. Adherents may be termed Jesuists, Jesusists or Jesuans. ^ The YWCA magazine, Volumes 66-67. 1972. p. 46.